The release by the British Library of Anthony Blunt’s memoirs is a good time to return to Miranda Carter’s brilliant study of the art historian turned Soviet spy, Anthony Blunt: His Lives (Pan, 2002). 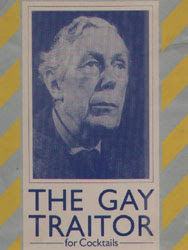 Those who visited Manchester’s legendary nightclub, The Hacienda, will remember that it had a bar called The Gay Traitor over which hung a portrait of Blunt. wasn't there a bar called the fourth man in the 90s too?